I’m writing this post from the waiting room of a hospital’s surgery ward. The Soldier is beginning the process of repairing more than twenty-five years of beating up his body. I’m a pessimist by nature. Writing helps me keep my mind off of the variables associated with surgery of any kind. This Larb Moo is also helping me stay occupied. This is our lunch today. It will be something quick and tasty; it’s also one of the big guy’s favorites. 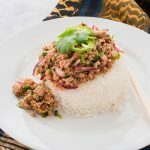 Larb, as it’s commonly referred to, is a sour minced meat dish from Laos. The larb served in most Thai restaurants isn’t nearly as authentic as the original. This version, made by me, is probably even less authentic. But, it’s good as hell, so it doesn’t matter. It can be made spicy, but it doesn’t have to be if you have a sensitive palate. 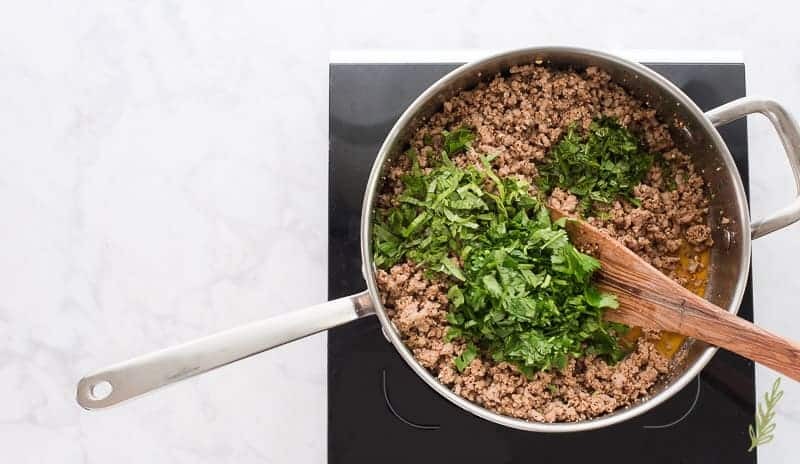 Larb can be made with pork, beef, chicken, even duck! Larb moo is pork, though- just FYI. What all larb must have is a toasted sticky rice powder. That is a non-negotiable. 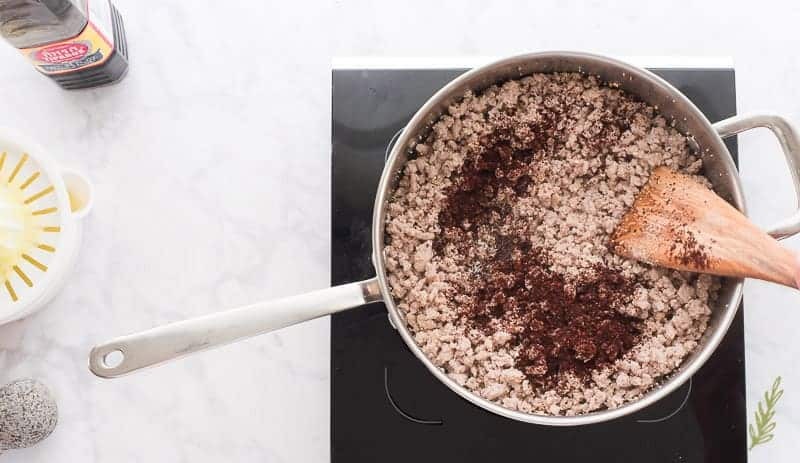 Toasted sticky rice (khao khua) is one of those ingredients that you didn’t know was essential until you’ve tasted a dish that was made without it. Khao khua adds a textural element, as well as a smoky, almost nutty, flavor to any dish it’s added to. In other Laotian and Northern Thai (Issan) recipes (especially soups), khao khua is used as a thickening agent. Don’t succumb to the temptation to skip this process. 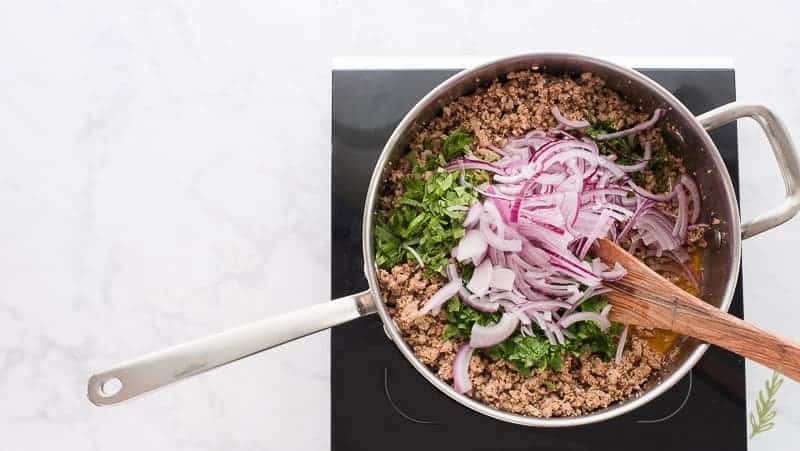 This single ingredient is one of the fundamental flavors in this larb dish. It’s soooooo easy to make, too! One ingredient- sticky rice. Two tools (well, three if you count the stove)- a saute pan and a wooden spoon to stir the rice. You have the “soul” of this larb in ten minutes, or less. You can do ten minutes, right? Right. That’s why we’re friends. 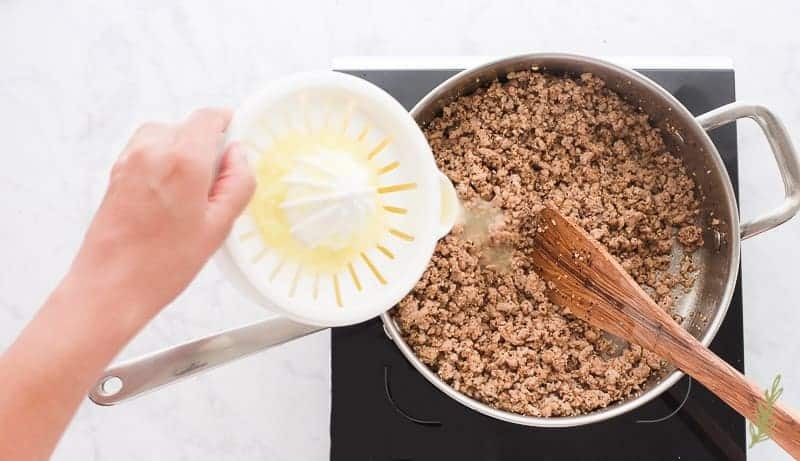 Add three tablespoons (or more if you want to make enough for another time) to your sauté pan and heat over medium-high heat. Use a wooden spoon to stir the rice occasionally to avoid scorching it. The end goal that we’re trying to achieve with the khao khua deep, golden brown in appearance, and a nutty aroma should waft from the pan. Once you’ve reached that point, pull the pan from the heat and allow the rice to cool in the pan until room temp. Depending on how much rice you’ve toasted, this can take anywhere from five to ten minutes. After the rice has cooled, pour it into a mortar and pestle, a coffee grinder, or a food processor. The reason we need the rice to be cooled is because we don’t want the hot rice to begin steaming during the grinding process. If you were to go straight from toasting to grinding, you’d end up with rice paste instead of powder. Patience is necessary. 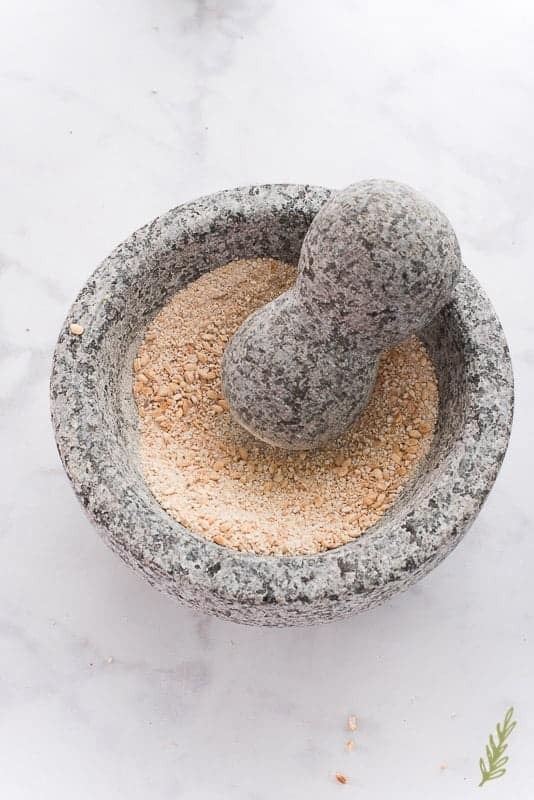 Use the pestle, or your preferred grinding method, to crush the rice into a fine powder. I actually like my khao khua on the chunky side so I hold back on the pulverizing. It’s tough to use restraint, because I have anger issues, but I do my best. After you’ve achieved maximum powder-i-ness (totally not a word), set this to the side. I just leave it in the mortar because I don’t want to create extra dishes for the kids. (Mom of the Year right here). The rest of the larb moo will come together pretty quickly. Add the ground pork to the same sauté pan you used to toast the rice. With the same wooden spoon (notice a trend of saving dishes? You’re welcome), and over medium heat; brown the pork until no pink is visible. 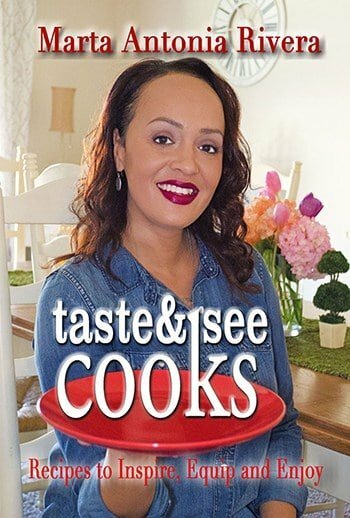 I like to get mine to a nice, crisp state because it adds more flavor to the final dish. While you’re waiting for your pork to brown, juice the limes using your citrus juicer. Set the juice to the side and, if the meat is browned completely, drain off any excess fat from the pan. The traditional larb isn’t drained, but I find that I can taste the fattiness if I leave the grease in. This is a matter of preference. 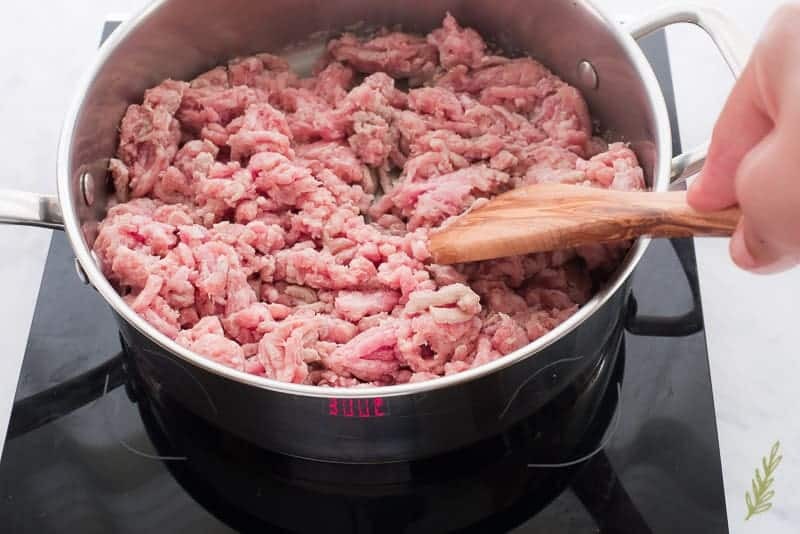 After you’ve drained the meat, return it to the pan and turn the heat to low. Add a few tablespoons of the khao khua to the meat and stir well to combine. We’re going to add some flare to this dish by stirring in red chili flakes. There are all sorts of powdered chili flakes on the market. I want you to avoid the red chili flakes that you’d find in pizzerias, though. They don’t have the same flavor profile we want in this recipe. Grab a chili flake powder from an Asian country and you should be good. I use these particular chili flakes because I always have them on hand for Korean recipes. This is a good alternative, as well. Part of the salt (or umami) in this recipe will come from fish sauce. This is fermented fish juice- plain and simple. It has a “unique” smell, but tastes sooooooo good. It’s another one of those ingredients that you don’t know you need until you’ve tasted a dish made without it. 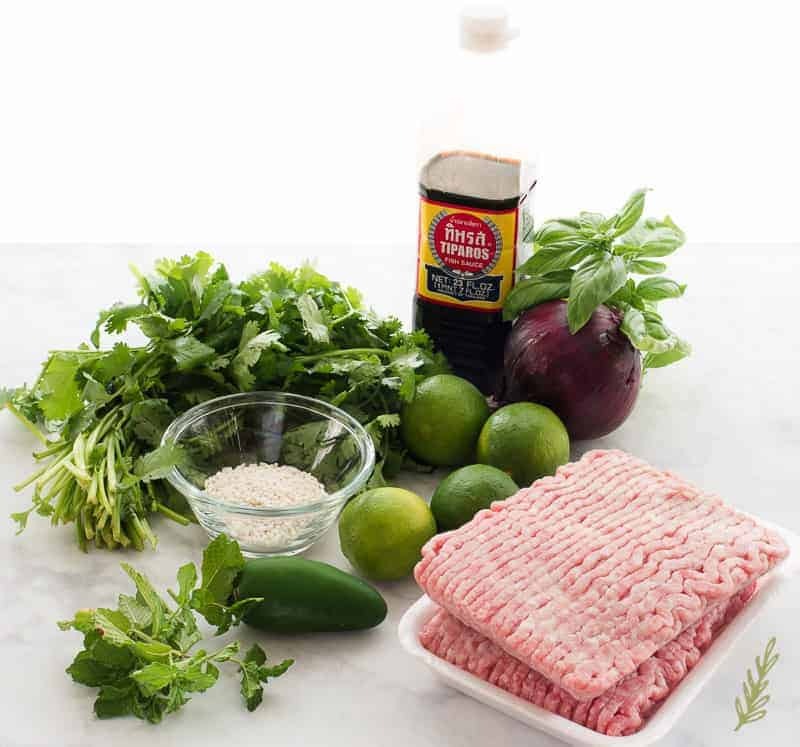 Fresh lime juice is the prominent flavor of any larb. For me, I need a heavy pour of lime juice. You may prefer a lighter touch, because it does make it slightly sour; but this is yet another ingredient that’s a must. Herbs are next. Thai basil is preferred, but Genovese basil (the one commonly found in supermarkets) is a good substitute. Add the chopped basil, mint and cilantro to the pan. Again, I add a heavier hand of cilantro and mint, but you can scale it back if you prefer. Thinly sliced red onion is our final ingredient. Shallots or Thai shallots are also a good option. I obviously live in a food desert, because I couldn’t find either at my local food market. 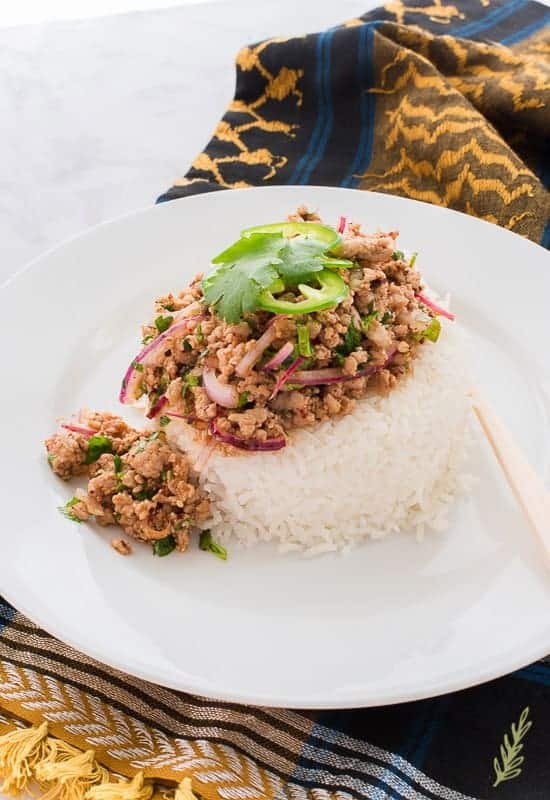 Stir everything together, then spoon the larb moo over a healthy portion of jasmine rice, basmati, or sticky rice. Jasmine rice is my favorite because it has a floral taste. Plain, long-grain white or brown rice will do as well. The surgeon just came out and told me the Soldier’s surgery was a perfect success, thank God. The hard part- nursing him back to health and his rehab- is still to come. Send up a prayer for him, will you? Heck! Send a prayer for me, too. Most medical professional are notoriously horrible patients. This larb moo will temper him, but we could use the extra help. Pin this recipe for later and share with your friends. This recipe makes enough for eight dinner-size portions. Reduce by half if you need less. 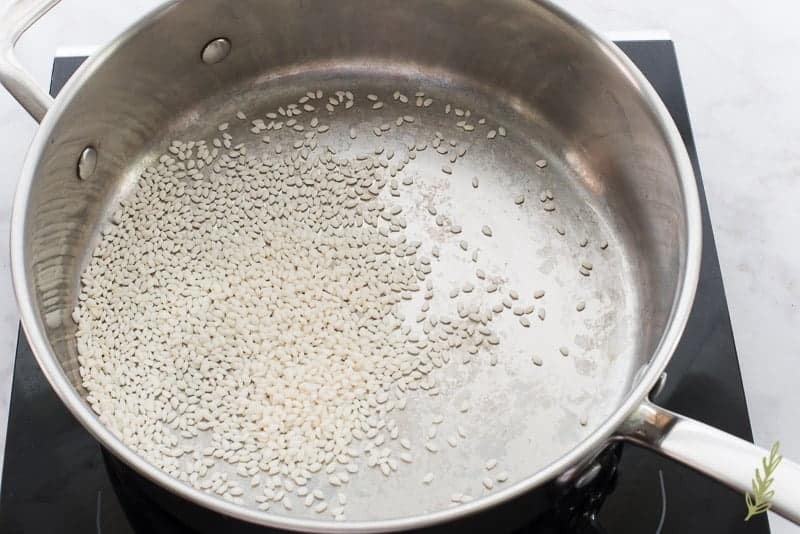 Add the sticky rice to a sauté pan and heat over medium-high heat. Use a wooden spoon to stir the rice occasionally to avoid scorching it. 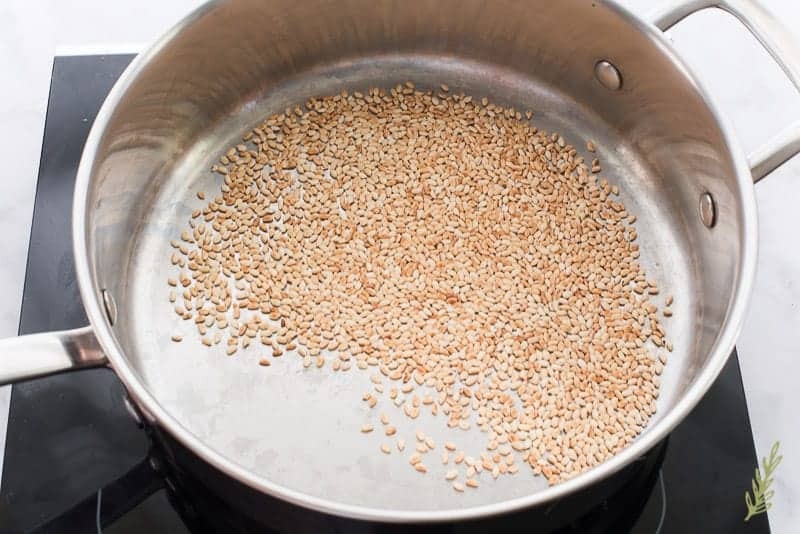 Toast the rice gently until it reaches a deep, golden brown color. Once the rice is toasted remove the from the heat and allow the rice to cool to room temp. Crush the rice to a fine powder using a mortar and pestle, a coffee grinder, or a food processor, once it has cooled. Using the same sauté pan you used to toast the rice, brown the ground pork over medium-high heat. 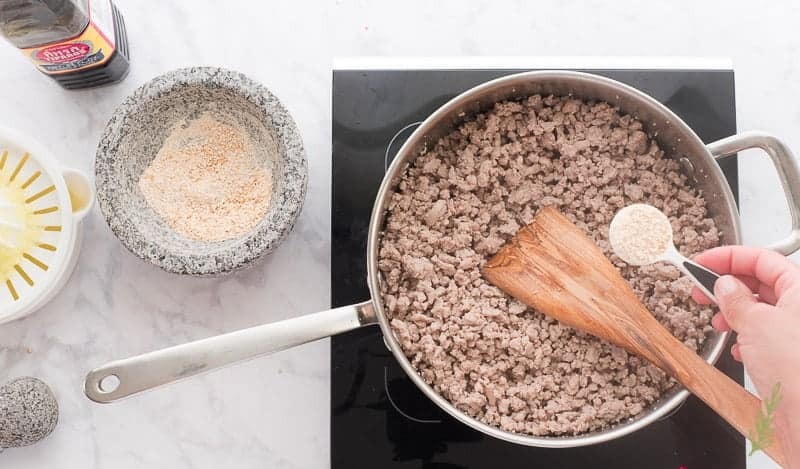 Use the same wooden spoon as before to break the pork into small pieces as you cook it. Brown the meat for 10 minutes, or until no pink shows, and the meat is cooked through. 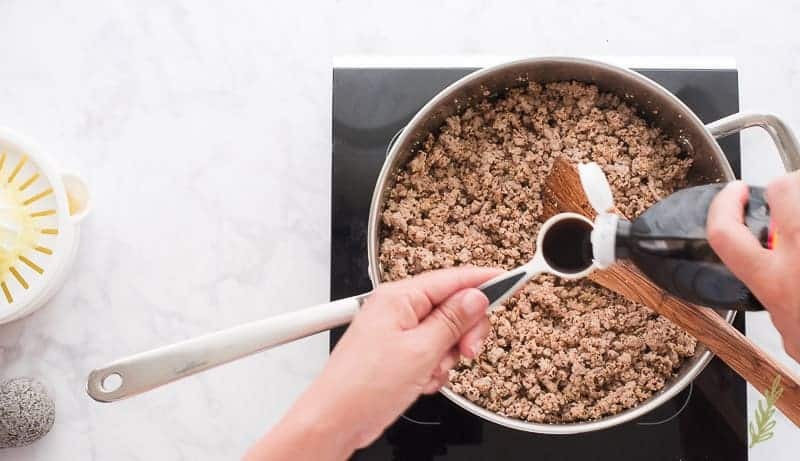 Once the meat has cooked, drain any excess fat from the pan. Reduce the heat to low and add 3 tablespoons of the khao khua to the meat, followed by the chili flakes. Stir to combine. Add the fish sauce and the lime juice. Now add all of the herbs and the red onion. 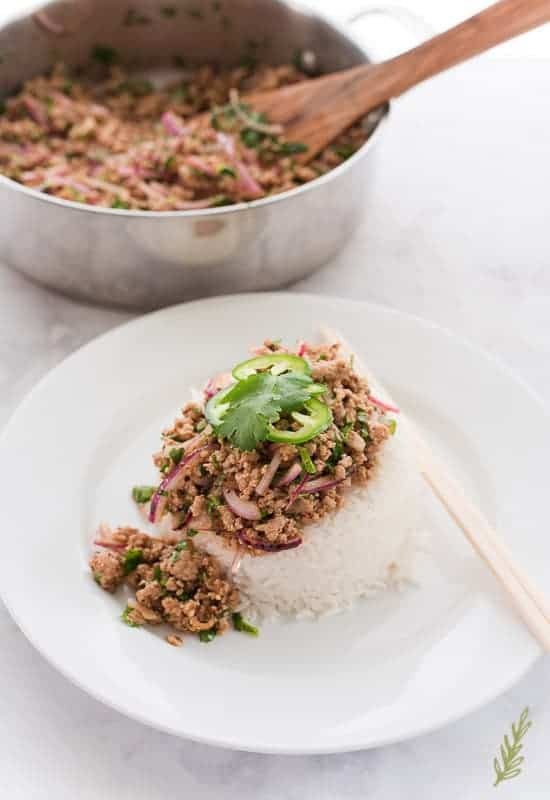 Stir everything together, then spoon the larb moo over jasmine rice. Garnish with additional chopped cilantro and jalapeño peppers, if desired.Leftovers will keep for 48 hours in the refrigerator and can be reheated in the microwave or on the stove. Omg, I think I have all these ingredients in the house. I might just have a dinner plan now. Yay! P.S. Best to you and the Soldier in the recovery stage. Great!! I think you’re going to love it, Julie! Thanks so much. He’s actually doing pretty well today. I’ve never tried larb moo, but it looks like something I could love, need to try it! Definitely, Mimi! You’ll definitely like it. Oh, the rice is just a side. The main recipe is pork, Paula. This dish intrigues me! Hope your husband heals quickly, surgery is no fun. Thanks, Amanda! He’s doing very well. A bit stubborn, but not too bad. This looks delicious! I’d love to try it with chicken or beef. It is great with either, Jazz! Thanks! Yum! This looks like it’s straight from a restaurant. Can’t wait to try it! Thanks, Whitney! 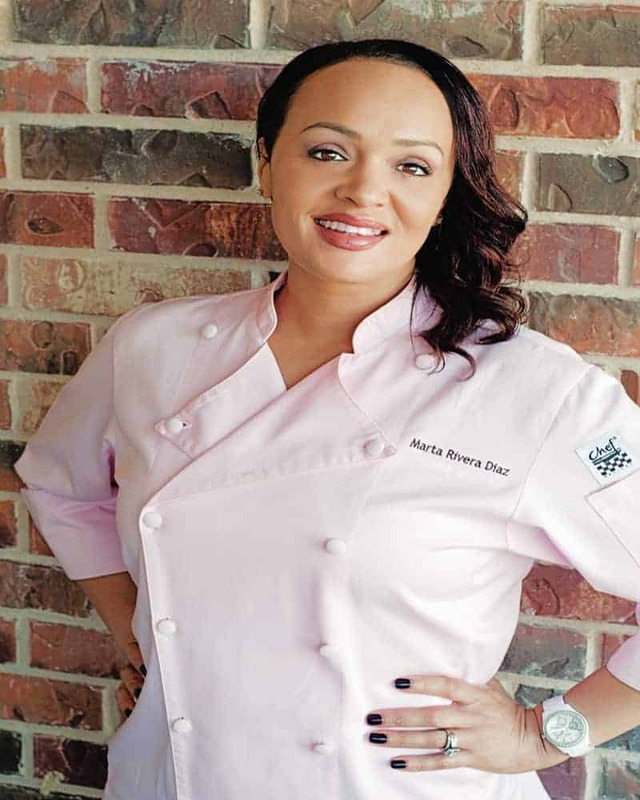 I’d like to think my inner sous-chef comes out occasionally, LOL!! 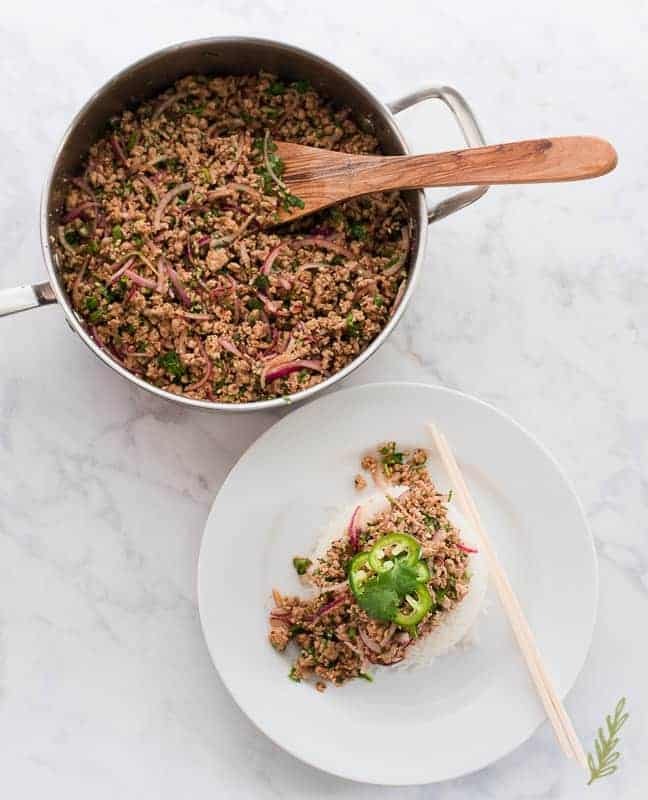 I have never heard of Larb Moo, but it looks like a delightful dish! I love that it has layers of flavor, but does not appear to be heavy. Perfect for summer! Thanks for sharing. It IS surprisingly light, Jennifer. It’s also a great dish served cold. Wow, this sounds really good. I love red onion in dishes, yummy! Me too, Justine! It adds so much flavor, right? I have never had something like this before. Pork is a meat I love but can never figure out how to cook with so this is amazing. This is great because it uses ground pork which is one of the cheaper ways to cook with it, Becca! I often make a Thai version with added fried garlic and chopped peanuts, but yours looks superb and I’ll be giving it a try. I also wanted to praise you for your beautiful writing. It was an absolute pleasure reading this post. 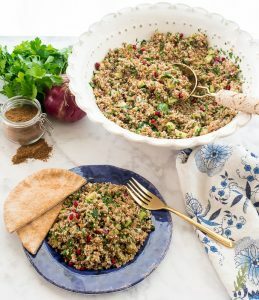 I discovered you today from linking from Simply recipes weekly menus and will keep coming back now! Thank you. PS Hope The Soldier is okay. Hi Crystal! I’m happy to have you here. Your version, with the fried garlic, sounds really good as well. The Soldier is mending. Funny enough, he had his other shoulder done this past Monday! Thanks for asking about him. I’m the guy who was having surgery when Marta wrote this post. She failed to mention that in addition to being a horrible patient, I’m a terrible cook. Isn’t that just shameful? Anyway, I love Asian food. 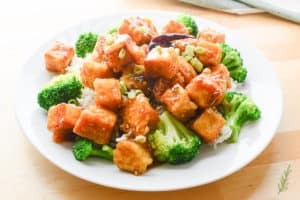 Today, I cooked used this recipe with a bit more than 2 pounds of ground chicken. It came out GREAT! The instructions are well written and easy to follow. I delivered a great lunch meal for Ma & the twinks, without disasters or re-dos. Thanks for your attention to detail, love. LOL!! Yes, you’re a better cook when following my instructions than you ever were a patient! Thanks for commenting!